Housing development data provides information on the number and location of existing dwellings, vacant residential land, and recent residential development across all land within metropolitan Melbourne. The data can be used to investigate residential change including the growth of housing stock, changes in housing density, and housing change in planning zones. There is now ten years of Housing Development Data. Data is prepared for all individual lots across Melbourne where there is an existing dwelling or the lot is located in a land use planning zone that provides for residential uses. New housing and increased densities are being successfully directed to the areas with the best access to jobs, services and transport. Reforms to the business/commercial zones in 2012-13 have resulted in significant housing development in commercial/mixed use locations. Heritage controls are effective in both limiting demolitions and housing growth in heritage areas. A summary presentation (PDF, 2.3 MB) of key insights in the report is also available. Revision: Table 2 in the report and corresponding table in the summary presentation were revised in April 2018. 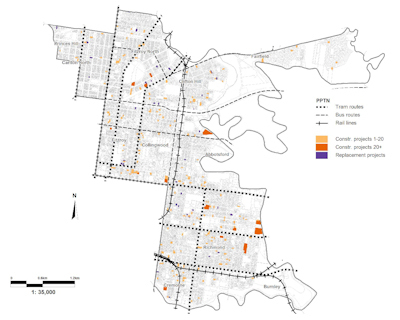 Summary reports of housing development across Metropolitan Melbourne for 2005 to 2016 derived from the Housing Development Data. Each region PDF also contains the Local Government Areas in that region. Data for metropolitan Melbourne (31 Local Government Areas) can be downloaded through the Data Vic website. Both files are available in a number of spatial formats and explanation of the attributes used in the data is available in the data dictionary. The Project layer depicting housing activity over the years from 2005 and 2016 shows twelve years of development activity. The Stock layer for calendar year 2016 shows the number of dwellings on a lot as at 2016.